Krispy Kreme adds the new Trick-or-Treat Donut as part of 2018's Halloween line-up. The Trick-or-Treat Donut takes an Original Glazed Donut and dips it in salted caramel, tops it with chocolate Halloween candy pieces, and drizzles it with more salted caramel. Also new this Halloween is the Monster Batter Donut, which is basically a Halloween-themed Birthday Cake Batter Donut. It features a yeast shell donut with cake batter filling dipped in "slime green" icing and topped with sugar monster eyes and festive confetti candy. Joining the two new donuts for Halloween are the returning Jack-O-Lantern Donut and Chocolate Iced Donut with Halloween Sprinkles. The Jack-O-Lantern Donut is a yeast shell donut dipped in orange icing and decorated with chocolate icing. The Chocolate Iced Donut with Halloween Sprinkles is a Original Glazed Donut dipped in chocolate icing and topped with Halloween-themed sprinkles. This year's Halloween selection is available through October 31, 2018 at participating US locations. 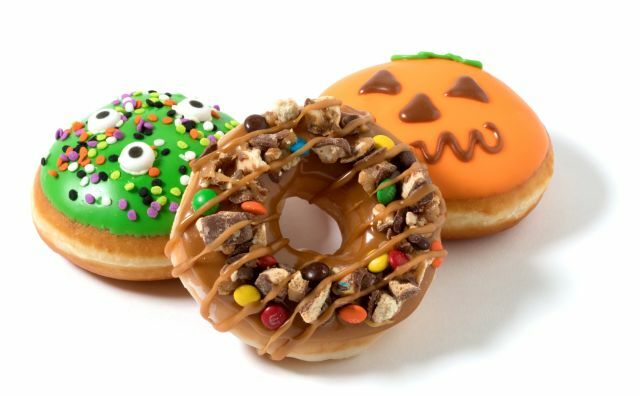 Additionally, Krispy Kreme will be celebrating Halloween by offering a free donut of your choice if you stop by a participating US store while wearing a costume on October 31, 2018.